A game that I use for groups that are new to tabletop games. Relatively easy to teach, simple game mechanics, light strategy, nice graphics and good quality components. Follow the illustration in the rule book. Relatively simple and fast. Everyone starts in the center tile which is also the tile that one must be in to make an offering. 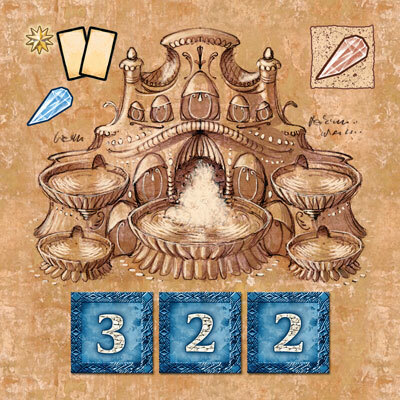 On a player’s turn, he moves up to 2 steps (each tile is a step), play cards on hand to make contribution to the building on the tile (optional), then discard (optional) and draw cards. The cards represent different races with different coloured resources and powers. Combining card abilities and resources to make efficient contribution is a main element of gameplay. When required amount of contributions are made on a building tile, the building is completed and flipped over. Players making contributions to the building get rewards ranging from crystals, dragon scales and cards. Crystals are used for making offerings. Dragon scales are collected when a contribution is made on a building tile with dragon/s on it (dragons can be summoned by card powers). Players with certain numbers of dragon scales will be rewarded with crystals. Throughout the game, players have to plan to move back to the center tile to make offerings to the obelisk using crystals. The 1st player that makes the required number of offerings wins the game. 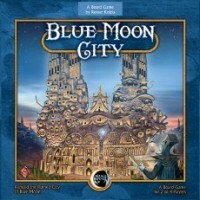 Add a Review for "Blue Moon City"